صبوریان سررودی, صابر, اردشیر, عبدالله, بهزادیان, کوروش, جلیل ثانی, فاطمه. (1393). مکان‌یابی بهینه ایستگاه‌های تزریق کلر با نرخ زوال غیر خطی در شبکه توزیع آب شهری. مجله آب و فاضلاب, 25(6), 77-87. صابر صبوریان سررودی; عبدالله اردشیر; کوروش بهزادیان; فاطمه جلیل ثانی. "مکان‌یابی بهینه ایستگاه‌های تزریق کلر با نرخ زوال غیر خطی در شبکه توزیع آب شهری". مجله آب و فاضلاب, 25, 6, 1393, 77-87. صبوریان سررودی, صابر, اردشیر, عبدالله, بهزادیان, کوروش, جلیل ثانی, فاطمه. (1393). 'مکان‌یابی بهینه ایستگاه‌های تزریق کلر با نرخ زوال غیر خطی در شبکه توزیع آب شهری', مجله آب و فاضلاب, 25(6), pp. 77-87. صبوریان سررودی, صابر, اردشیر, عبدالله, بهزادیان, کوروش, جلیل ثانی, فاطمه. مکان‌یابی بهینه ایستگاه‌های تزریق کلر با نرخ زوال غیر خطی در شبکه توزیع آب شهری. مجله آب و فاضلاب, 1393; 25(6): 77-87. 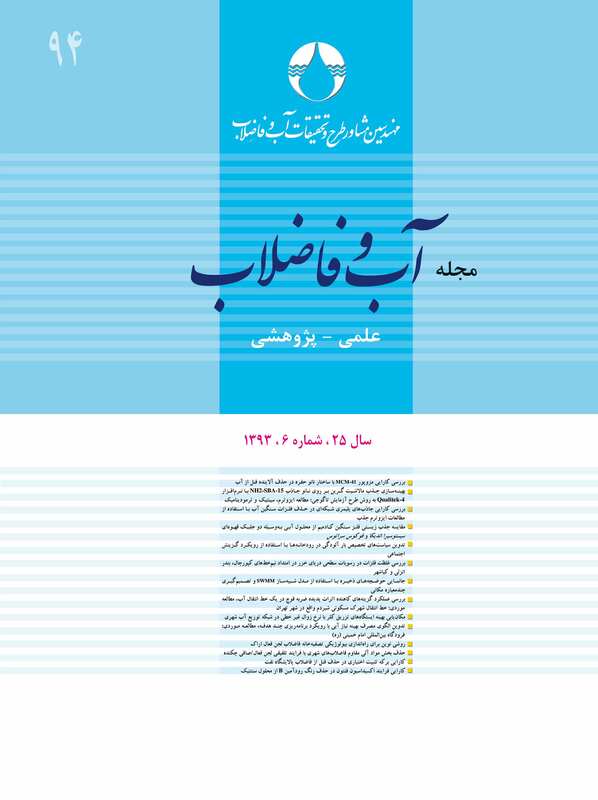 در روش‌های متداول مکان‌یابی بهینه ایستگاه‌های بوستر پمپ کلرزنی برای افزایش سرعت دستیابی به جواب نهایی، از فرض خطی بودن نرخ زوال کلر استفاده شده است. بررسی میزان خطای ناشی از این فرض، نشان دهنده خطای غیرقابل اغماض آن به‌ویژه در حالت نرخ واقعی زوال با مرتبه بیشتر از یک است. این پژوهش، یک متامدل نوین برای حل مسئله بهینه‌سازی چندهدفه مکان‌یابی ایستگاه‌های تزریق کلر با نرخ زوال غیرخطی ارائه می‌نماید. در مدل پیشنهادی، متامدل عبارت است از شبیه‌سازی‌ مدل کیفی شبکه توزیع آب با فرض برقرار بودن اصل برهم نهی، برای نرخ واکنش غیرخطی زوال کلر. برای این منظور، ابتدا غلظت کلر باقیمانده در شبکه حاصل از تزریق واحد کلر، برای کلیه نقاط جداگانه خارج از حلقه بهینه‌سازی، محاسبه ‌شد. سپس در داخل حلقه بهینه‌سازی، غلظت کلر باقیمانده در شبکه برای جواب‌های مسئله بهینه‌سازی که به‌صورت ترکیب کلرزنی از نقاط و مقادیر تزریق مختلف بود، از رویکرد متامدل مذکور به‌صورت ترکیب وزنی بخش ابتدایی محاسبه ‌شد. مقادیر توابع هدف جواب‌های مسئله بهینه‌سازی چندهدفه ابتدا توسط این متامدل به سرعت برآورد ‌شدند. با توجه به خطای برآورد متامدل، برای کاهش خطای زیاد ناشی از تقریب متامدل پیشنهادی، توابع هدف جواب‌های برتر، مجدداً با استفاده از مدل کیفی واقعی (بدون استفاده از اصل برهم‌نهی) ارزیابی شده و جایگزین مقادیر محاسبه شده توسط متامدل شدند. نتایج مدل پیشنهادی نشان دهنده سرعت بسیار زیاد اجرای مدل بهینه‌سازی در عین دقت مناسب این روش نسبت به روش‌های متداول پیشین بود. Conventional methods for solving the problem of site location for booster chlorination stations have assumed the use of linear superposition principle for first-order kinetics of chlorine decay in water distribution systems in order to speed up the process of evolutionary algorithms. However, examination of this assumption in this paper shows that it causes a non-trivial error, especially when the order of chlorine decay rate is more than one. This paper presents a novel meta-model for solving the multi-objective optimization problem of optimal locations for booster chlorination stations for the nonlinear order of chlorine decay rate. In the proposed model, the meta-model is the water quality simulation model quantified by the principle of linear superposition for nonlinear kinetics of chlorine decay. To do so, residual chlorine concentration is calculated from the injection unit chlorine concentration at each node in the network as offline outside the optimisation loop. Then, within the optimization loop, the residual chlorine concentration in the network obtained for the optimal solutions is calculated as the combined chlorine injected from different locations and at different concentrations based on the linear superposition meta-model of the previous part. Objective functions of the optimisation solutions are quickly evaluated by this meta-model. In order to mitigate the significant error due to the estimation of this meta-model, the fitness of the best solutions are again evaluated using the real water quality simulation model (nonlinear chlorine decay rate) and replaced with the evaluations previously approximated by the meta-model. The results show the desirable accuracy of the proposed model and the high speed in the run time of the hybrid optimisation model. 1. Hall, E. L., and Dietrich, A. M. (2000). “A brief history of drinking water.” Opflow, 26(6), 46-51. 2. Behzadian, K., Alimohammadnejad, M., Ardeshir, A., Jalilsan, F., and Vasheghani, H. (2012). “A novel approach for water quality management in water distribution systems by multi-objective booster chlorination.” International Journal of Civil Engineering, 10 (1), 51-60. 3. Prasad, T., Walters, G. A., and Savic, D. A. (2004). “Booster disinfection of water supply networks: Multiobjective approach.” J. of Water Resources Planning and Management, 130, 367-376. 4. Ardeshir, A., Alimohammadnezhad M., Behzadian K., and Jalilsani, F. (2011). “Control of THM formation in multi-objective booster chlorination for water distribution systems.” Computing and Control for the Water Industry, CCWI Conference, Urban Water Management-Challenges and Opportunities, Exeter, UK. 5. Wable, O., Dumoutier, N., Duguet, J. P., Gelas, G., and Depierre, J. F. (1991). “Modelling chlorine concentration in a network and applicationsto Paris distribution network.” Proc., Water Quality Modelling in Distribution Systems Conf., AWWA Research Fundation, Denver, Colo.
6. Hunt W. A., and Kroon, J. R. (1991). “Model calibration for chlorine residuals in distribution systems.” Proc., Water Quality Modeling in Distribution Systems Conf., AWWA Research Foundation, Denver, Colo.
7. Clark, R. M., Grayman, W. M., Males, R. M., and Hess, A. F. (1993). “Modeling contaminant propagation in drinking water distribution systems.” J. Envir. Engrg., 119(2), 349-364. 8. Rossman, L. A., Clark. R. M., and Grayman. W. M. (1994). “Modeling chlorine residuals in drinking-water distribution systems.” J. Envir. Engrg., 120(4), 803-820. 9. Tryby, M. E., Boccelli D. L., Uber J. G., Lewis and Rossman, A. (2002). “Facility location model for booster disinfection of water supply networks.” J. of Water Resources Planning and Management, 128 (5), 322-333. 10. Munavalli, G. R., and Kumar, M. S. M. (2003). “Optimal scheduling of multiple chlorine sources in water distribution systems.” J. Water Resour. Plann.Manage., 129(6), 493-504. 11. Rossman, L. A. (2000). EPANET 2: Users Manual, .pp. 43-44. 12. Rossman, L. A., Boulos, P. F., and Altman, T. (1993). ‘‘Discrete volume element method for network water quality models.’’ J. Water Resour. Plan. Manage.,119(5), 505-517. 13. Boccelli, D. L., Tryby, M. E., Uber, J. G., Rossman, L. A., Zierolf, M. L., and Polycarpou, M. M. (1998). ‘‘Optimal scheduling of booster disinfection in water distribution systems.’’ J. Water Resour. Plan. Manage.,124(2), 99-111. 15. Deb, K., Pratap, A., Agarwal, S., and Meyarivan, T. A. M. T. (2002). A fast and elitist multiobjective genetic algorithm: NSGA-II.” Evolutionary Computation, IEEE Transactions on, 6(2), 182-197. 16. Behzadian, K., Kapelan, Z., Savic, D., and Ardeshir, A. (2009). “Stochastic sampling design using a multi-objective genetic algorithm and adaptive neural networks.” Environmental Modelling and Software, 24(4), 530-541.